Last week we described an inherent flaw in the performance reporting format the SEC requires every mutual fund to include in their prospectus and annual report (see “Rethinking Performance Standards (Part I – The Fatal Flaw,” FiduciaryNews.com, November 13, 2018). This reporting format is pervasive. It can be found in nearly any investment savings vehicle. Retirement savers are most vulnerable to this flaw, as 401k plans, through their service providers, likely use this same format. What we’re referring to is the standard 1, 5, and 10-year reporting format. On the face of it, the format appears to reflect a diverse data set (by using reporting periods with different durations). In reality, though, it produces a phenomenon known as the “Snapshot-in-Time Anomaly.” The Snapshot-in-Time Anomaly occurs when an arbitrarily selected period end dramatically changes the results compared to other periods. The anomaly tends to overweight the most recent data, skewing the performance for all ranges (e.g., the SEC standard 1-year, 5-year, and 10-year performance reporting periods). Chart 4 offers a real-life example of this Snapshot-in-Time Anomaly. Here we see rolling 5-year returns for the S&P 500. Normally, investors would see only one of these 5-year return figures (together with the associated 1-year and 10-year returns). The first thing that pops out is exactly how bad the first decade of the new millennium was. That’s less important for what we’re talking about here. Note the years 2008 and 2013. In 2008, the five-year return dropped to a negative number from a double-digit return in the five years ending in 2007. 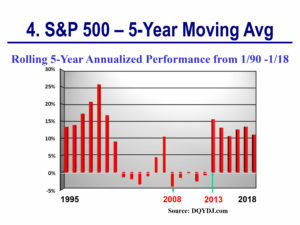 In 2013, the opposite situation occurred, with the five-year return number rising to double-digits from a negative return in the five years ending in 2012. In 2008, two things happened. First, the tremendous year of 2003 with its 20+% return rolled out of the five years. Second, it was replaced by the horrendous year 2008 when the S&P lost 40%. Likewise, in 2013, the horrendous year of 2008 dropped out while the great year of 2013, with its nearly 30% return, replaced it. Individually, these five-year returns reveal nothing. Taken together and shown in a rolling five-year chart, they tell you very much. Armed with this, let’s review the problem presented last time. 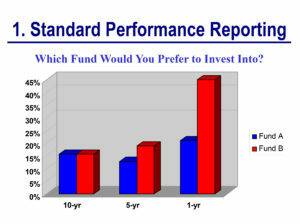 Presented with the standard reporting formats (Chart 1 and Chart 2), an investor is likely to pick fund B. The real-life experience of a regular investor (like a typical 401k plan participant) yields an unsettling result (Chart 3). How can investors, and the fiduciaries responsible to them, avoid this fatal flaw intrinsic to SEC-mandated performance reporting formats? Let’s take this new point of view, one that should help considerably. 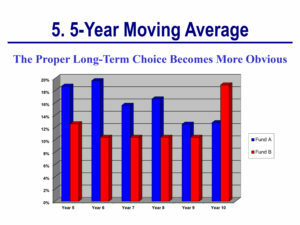 Chart 5 represents a series of rolling 5-year performance returns (i.e., the 5-year moving average). 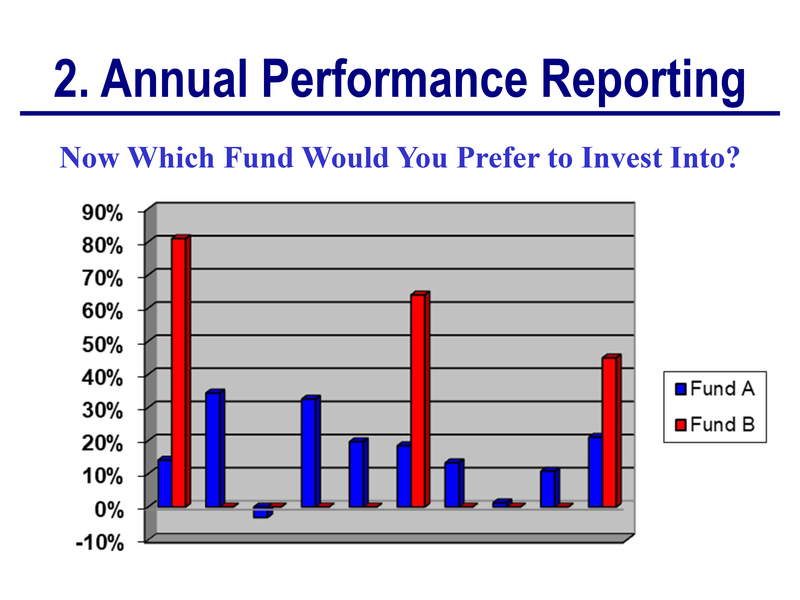 For example, the bars entered above Year 5 contain the returns for the period from Year 1 to Year 5. The bars entered above the space for Year 6 contain the returns for the period from Year 2 to Year 6. And so on. 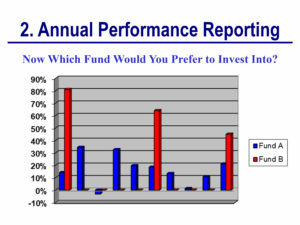 Unlike Chart 2, which shows distinct annual returns, Chart 5 contains overlapping periods. Why five years? 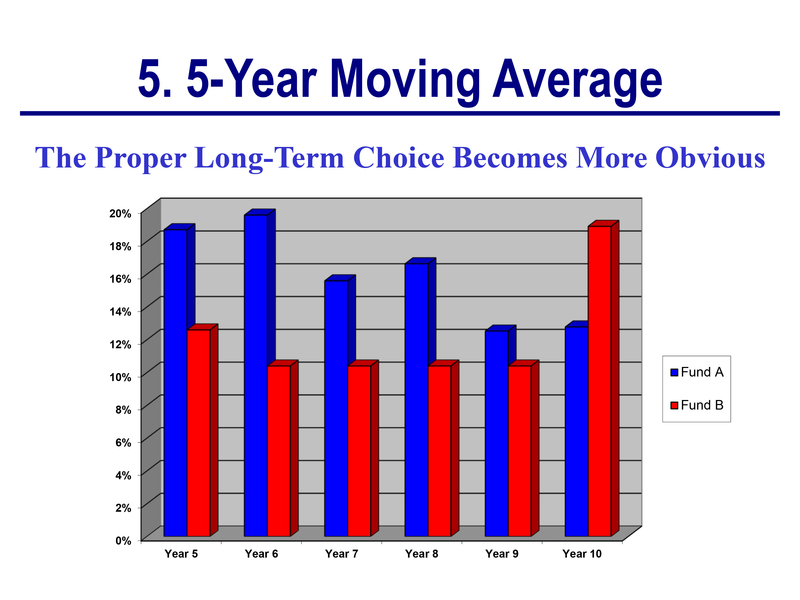 Well, we could have easily picked any number, but since we’re focusing on long-term investors, we’ll pick the shortest generally recognized long-term period (i.e., five years) in order to maximize the information yield based on the data available to us (i.e., annual data). Please note, while the graph below may appear to contain less data than Chart 1 (in particular, the 10-year total investment return) and Chart 2 (ten years of annual investment returns), in fact, Chart 5 contains the exact same performance data (but does so in a more revealing manner). 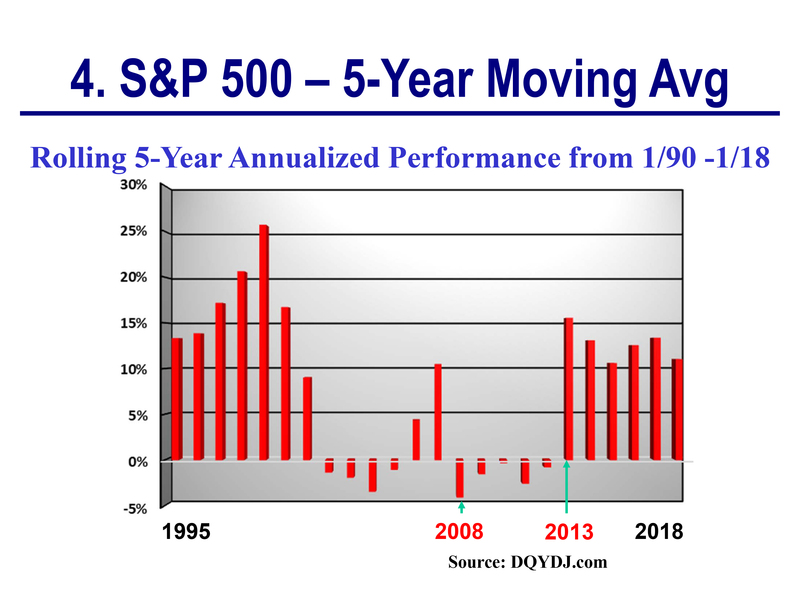 A graph of rolling 5-year annualized performance returns offers a significant advantage for long-term investors, especially those who contribute regularly to their portfolios, (e.g., employees who defer a portion of their earnings into a 401k plan). This type of graph quickly shows the investor the range of long-term returns that might be expected when investing recurrently over any period of time. For example, if we invested in Year 1, we could see in five years our investment would yield more than 19% in Fund A versus about 12% in Fund B (this is represented by the bars above Year 5 – i.e., five years after our initial investment). 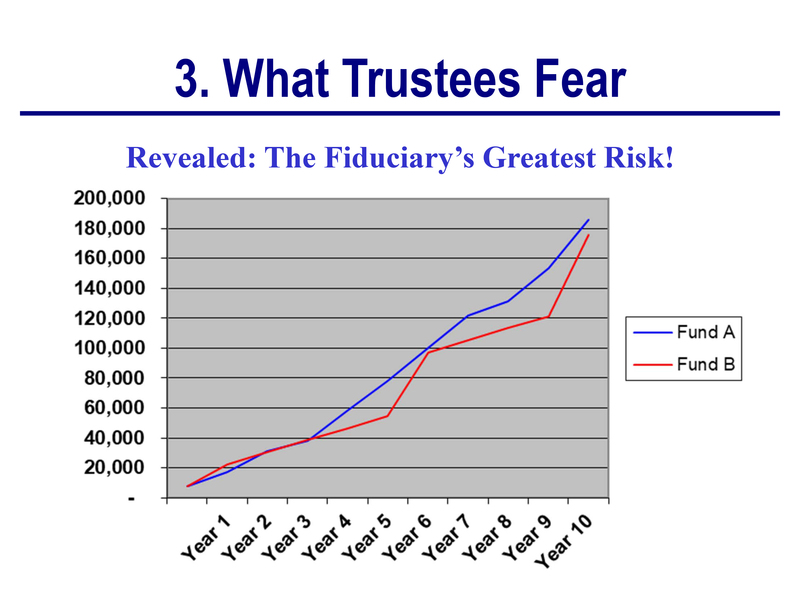 By examining Chart 5, the typical fiduciary, for example, would immediately see Fund A represents the more consistently attractive investment over time. Fund A beats Fund B in every rolling five-year period save the last one; hence, the accident of timing and the fatal flaw that we saw earlier. This flaw is similar to the “blinker” problem encountered by securities analysts who screen for stocks. Very often, a stock will appear on last month’s screen, but not on this month’s screen. An analyst who doesn’t regularly run screens might buy a stock that appears on a screen due only to the accident of timing. 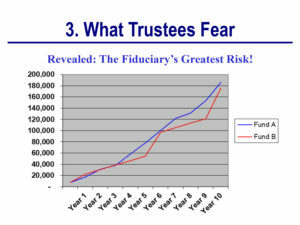 In our example, the rolling five-year graph allows the fiduciary to see the results of several “screens” all on one graph. A fiduciary who only looks at the most recent reporting period stands to make an unfortunate – and potentially damaging – investment decision. An investor who fails to undertake comprehensive due diligence only hurts himself. A fiduciary who makes the same mistake unnecessarily exposes himself and his company to a liability that can otherwise be easily avoided. Unfortunately, the government and the industry continue to employ the traditional performance reporting standard; thus, leaving the investing public and fiduciaries vulnerable and, as we’ve suggested, vastly uninformed. 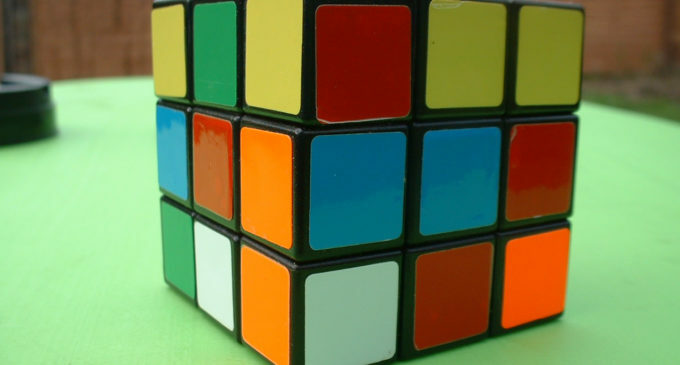 As a result, until a new standard is adopted, smart fiduciaries who seek to conduct the necessary due diligence must create sometimes complicated spreadsheet algorithms to extract rolling five-year charts. Small to medium sized Plan Sponsors hire insurance companies as their Third Party Administrators, and the TPA completes the SEC-compliant paperwork. If the employer/Plan Sponsor actually receives a copy of the reports, they would seldom read or understand the documents, leaving the Fiduciary open for possible fraudulent activities by the TPA. I think most 401(k) investigative resources would agree that the Plan Sponsor must retain the services of separate parties involved in this process. Where the TPA, Insurance Carrier, Plan Administrator, Recordkeeper and Investment Adviser are all the same individual or affiliated companies, the fiduciary risks are much greater. Hiring independent entities for the above positions provides a “checks and balances” approach which makes sense to protect your fiduciary risks.